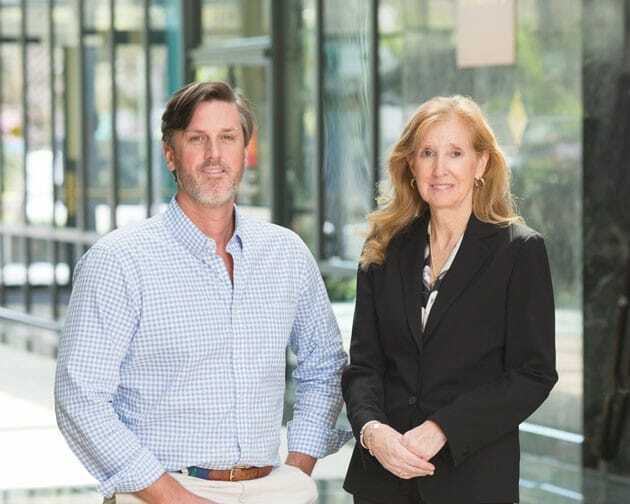 Tenant: Uncle Sam | HC Government Realty Trust, Inc.
Ed Stanton and Elizabeth Watson hope to capitalize on the highly fragmented sector of federal government-occupied office properties through HC Government Realty Trust, a firm founded last year in Sarasota. Ed Stanton knows what he wants. The founder of Holmwood Capital LLC and its recently minted spin-off, HC Government Realty Trust Inc., both in Sarasota, is looking to buy single-tenant properties occupied by the federal government. And not just buildings occupied by Uncle Sam — they need to come with the “full faith and credit” of the U.S. General Services Administration, the agency that oversees all government properties. He’s targeting buildings ranging in cost from $5 million to $15 million, and they need to be in secondary or tertiary markets, too: No sprawling, columned, Washington, D.C., agency headquarters need apply, thank you very much. And they need to provide “essential services” for the city or town they’re located in. Think the local Social Security Administration offices in Norfork, Va., for instance, which HC Government obtained earlier this month when it cemented a $14.5 million deal for a 54,000-square-foot building. HC Government has also acquired properties occupied by Homeland Security, the FBI, the Department of Transportation, the Drug Enforcement Administration and others. Perhaps most importantly, Stanton wants buildings whose tenants have long lease commitments and little motivation to move when their deals expire. “It’s a very specific strategy of buying particular assets in secondary markets within a certain price structure,” says Stanton, 42, who founded Holmwood Capital in 2010 after stints at former brokerage firm Spaulding & Slye and SRS Investments, a company he formed in 2005 where he had his first introduction to GSA-leased properties. Norfolk became HC Government’s 11th acquisition in all, its largest single deal by square footage to date and the latest in a march to raise $30 million in equity. If all goes well, HC Government will have raised two-thirds of that amount by the end of this year. To date, the company’s portfolio contains roughly 210,000 square feet in buildings in seven states, and it’s valued at about $62 million, according to HC Government data. Within five years, Stanton hopes HC Government will have grown to $150 million. If it can get there and meet certain other U.S. Securities and Exchange Commission requirements, Stanton, President Robert Kaplan Jr., a Virginia attorney, and Chief Financial Officer and partner Elizabeth Watson hope to take the company public as a real estate investment trust. If that access to public capital markets occurs, the trio contend HC Government could leverage roughly $500 million worth of properties and have a market capitalization of some $700 million. Under federal law, REITs must pay out 90% of their income to shareholders in the form of dividends, so investors often look for the predictable sort of income streams that trusts provide to park money in. Both Watson and Stanton contend the timing could be ideal, though, the result of several factors that have influenced government leasing and development in recent years. The first occurred in 1990, when the Americans With Disabilities Act was passed, which stipulated that handicapped or disabled people must be provided equal access to public buildings. Five years later, the bombing of the Alfred P. Murrah Federal Building in downtown Oklahoma City forever changed federal government design standards. In the wake of the bombing, which killed or injured more than 850 people and resulted in more than $650 million in property damage, federal officials began working on ways to better insulate and strengthen buildings. After the terror attacks of 9/11, government officials went into hyperdrive with plans to replace aging government offices or renovate buildings. A construction boom was sparked, too, as the GSA moved to create single-tenant offices for agencies in pace of larger, multi-tenanted spaces. To do so, the GSA let out proposals for millions of square feet of office space for the newly designated Department of Homeland Security and others. Most of the space was developed by smaller developers, or so-called “merchant builders,” who would be paid a fee to construct offices to government specifications on a build-to-suit basis. Today, as a result, the largest owner of GSA-occupied assets controls less than 4% of all government space, at a time when federal leasing has gone from 60% of its occupied total before 9/11 to more than 70%. In all, the federal government has roughly 7,700 lease commitments nationwide, according to GSA data. HC Government has identified as many as 1,300 properties to date that meet its investment criteria. But the nascent company also faces some significant challenges going forward. More than half a dozen major players vie for government-occupied properties, including a spin-off of Health Care REIT, the acknowledged king of GSA-leased assets for now. “There are probably five or six big portfolios of 10 million square feet or more we’re competing with,” says Watson, who joined HC Government last year after decades in real estate with Columbia, Md., builder The Rouse Co., outlet mall developer Prime Retail, investment house Legg Mason Wood Walker, festival marketplace creator Enterprise Development Co., and others. Watson also was one of three founding employees of a company known as Government Properties Inc., which also focused on GSA deals. The company later merged with Health Care REIT. Additionally, Stanton acknowledges that while having a tenant that’s historically 95% likely to renew its lease is a considerable plus, being a government landlord can have its downside — especially today. That’s because if the government does vacate, HC Government could face an uphill climb in re-leasing a property that was specifically designed for the government. “So the challenge for us is we’re going to need to be great in finding opportunities, pricing them right and making sure the tenant is satisfied,” Stanton says. At least for now, the strategy has worked. Stanton says HC Government has another 10 deals in its pipeline for acquisition that it would eventually fold into the REIT.